Fall Timeshare Travel to Washington D.C.
San Francisco is a fascinating city, and a time share rental here will give you the home base and the time to explore this grand old lady. In Part 2 of our 6-Part series on cities with great walking tours, we'll take at look at what San Francisco has to offer. San Francisco Architecture Walking Tour. One of the things that makes San Francisco such a charming city is its unique architecture. It's because the architecture is so iconic - and so picturesque - that many television shows and movies have been filmed on location here. On this tour Rick Evans gives you not only an introduction to some of San Francisco's most famous downtown buildings in the financial district, including the TransAmerica Pyramid, but you'll also learn about such hidden treasures as rooftop gardens and unique open spaces. This is a fascinating way to learn about San Francisco's history through its buildings. Barbary Coast Trail. San Francisco had an exciting past that began with the California Gold Rush of 1848. On this tour you'll see such historical sites as a saloon where sailors were once "shanghaied," a national landmark building that survived the 1906 earthquake and fire, and an amazing "graveyard" of Gold Rush ships buried beneath the streets. The Barbary Coast was a red-light district in old San Francisco that arose from the massive infusion of treasure-seekers. The area quickly gained a reputation for rowdy behavior, gambling, prostitution, thievery, and murder. The Barbary Coast Trail walking tour has a lot to offer! 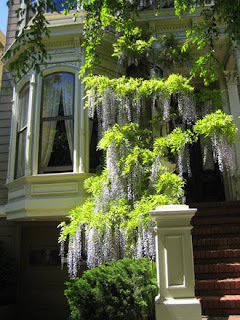 Victorian Home Walk (see photo). Offered by San Francisco Historical Walking Tours, you might want to consider this tour if you don't want to climb San Francisco's famous hills. On this tour you'll explore hill-free Pacific Heights, where you'll see beautiful Victorian row houses, famous mansions, and lovely gardens. You'll even get the chance to peek inside a period "Queen Anne" Victorian home. This is your opportunity to really get up close to some of San Francisco's most charming and alluring homes. All About Chinatown Walking Tours. No exploration of San Francisco would be complete without a look at the city's most famous neighborhood. The largest and most culturally significant "chinatown" outside of mainland China, this city within a city is exciting and lively. You'll see buildings of historical and architectural interest, including an authentic Buddhist Temple; you'll visit a fortune cookie factory; and you could even join a hosted 10 course dim sum luncheon. Many San Francisco timeshare rentals are available, including Nob Hill Inn, and The Suites at Fisherman's Wharf. Give yourself the opportunity to really get to know this fascinating city through its walking tours.